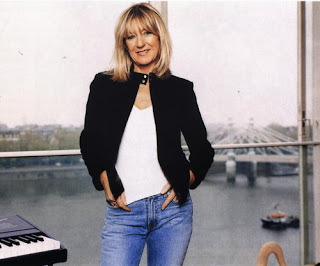 RETRO KIMMER'S BLOG: CHRISTINE MCVIE SITS IN WITH FLEETWOOD MAC! Christine McVie joined her former band Fleetwood Mac for one song each at a pair of concerts, and the first one took place yesterday at London’s O2 Arena. As Nicks suggested would probably be the case, McVie came out for ‘Don’t Stop’ — one of her signature Fleetwood Mac songs. The Sept. 25 show marked McVie’s first stage appearance with the band in 15 years. Following their highly successful tour behind the 1997 live album ‘The Dance,’ she quit the group, citing a desire to quit touring and step out of the spotlight; besides one solo album, 2004′s ‘In the Meantime,’ she’s largely remained silent since then.